I drove Honda’s next best seller from Monterey, California to San Francisco, and frankly, although the 2-row crossover was branded CR-V, my brain told me that I was driving a midsize luxury SUV. And that’s the direction Honda has gone in with the reinvention of its entire lineup. Comfortable, larger, more powerful, and refined, the 5th generation 2017 CR-V comes to market effectively reinvented, the visual is captivating, and the price point attainable. MSRP: LX $24,045 to Touring $32,395+. The short story here: Honda Motor Company, following the sales success of HR-V, Pilot and Ridgeline, hits yet another homerun with the reinvented 2017 Honda CR-V crossover. Designed in California, co engineered in Japan and manufactured in East Liberty Ohio, this compact brings superior performance to the most popular automotive segment in North America. With 4 million CR-V’s sold in the U.S. since its advent in 1995, it remains the best selling SUV of any size over its 20 year production run. I know, how can a compact crossover/SUV have attitude? This one does. Entering the confines of Honda’s most refined compact crossover presented to date, one discovers measurable refinement and uptic as to fit and finish; center stack design; hard and soft plastic to fabric and leather interface. There’s nothing cost cutting evident in CR-V’s redesigned interior layout, nothing! All controls and accessories available in the 4th generation CR-V’s cabin is easily accessible,, pleasing to the touch and eye, and on first impression, works as presented. For 2017, Honda expands cell phone connectivity, personal entertainment choices, and a much improved navigation visual. I spent a few minutes learning what turned out to be a near-intuitive static touchscreen monitor and voice command -- it works! And, in true Honda style, USB and charge ports abound,(front and rear) as well as ample cup-holders, cubbies, and a rather useful glove compartment. My wife will like that, no manual slides, easy ingress and egress, greater 2nd row legroom, and more storage, with an added 10+ inches of hauling platform behind the second row. What Honda does here with a couple of inches is just a tad mind boggling. And in true form, I performed my rear seat test. As a tall driver I don’t always fit comfortably on a 2nd row bench seat, in the case of 2017 CR-V, no problem. I discovered exceptional head, shoulder and legroom. Entering the second row was a bit tight for me, but hey, I’m big. Frankly, I experienced a bit of hesitancy in vacating Honda’s exceptionally comfortable driver's seat at the first change point along our 100+ mile drive route. Honda’s done much here to improve seating comfort and ease of adjustment, including an available new and improved power adjusted lumbar support. (Thank you!) After 30 minutes or so behind the wheel of the 2017 CR-V’s turbocharged 1.5 Liter fuel injected VTEC 4 cylinder (gasoline) engine, CVT shifted, all-wheel-drive (AWD) 2-row crossover, it occurred to me that a 10 hour drive in this Honda would be easily doable. Set the adaptive cruise control and lane keep assist, tune in your favorite source of music on the Touring’s premium sound system, adjust the leather clad, perforated heated seat back a tad, and go for it! Honda states that 2017 CR-V design was benchmarked against luxury class products, no doubt! One absolutely experiences a refined ride and drive experience while coddled in the safe connected confines of the most refined and powerful CR-V manufactured to date. 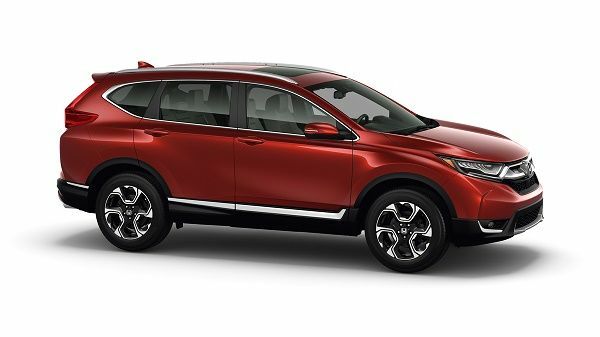 Honda adds 1.6 inches to CR-V’s wheelbase, while creating a substantial stance and just a bit of attitude via a wider profile, upgraded disk brakes, electronic assisted calipers and a lineup of custom wheel options. With the assistance of a much upgraded suspension, superior vibration hydraulic dampening and reduced road to cabin noise transfer, the 5th generation CR-V is measurably quieter in the cabin than the top 3 competitors when driven in a side by side comparison. Honda’s compact crossover brings a midsize SUV feel and solid refinement to the compact crossover segment. Although there may be slightly more powerful engine options available in this segment, none of the competition tops the total drive and ride package presented by 2017 Honda CR-V Touring. Honda’s 1.5 Liter DOHC direct injected Turbo engine produces 190 peak horsepower, and 179 lb-ft torque in the midrange, eliminating CVT “search and wander” high rev episodes. Throttle response was instantaneous, with no incident of traction loss noted, via Honda’s very tame CVT transmission -- in this application, thanks to “G-Shift” control, behaved more like a conventional automatic transmission. As experienced in the10th generation Civic Touring, the torque available in CR-V Touring is impressive, and ever present. Honda claims a best of segment (non-hybrid) 27 to 28 MPG City and 33 to 34 average MPG Highway, depending on drivetrain optioned. *Your MPG will vary. A return of the mechanically bulletproof 2.4L DOHC 1-VTEC 4 cylinder gasoline engine is standard issue for the entry trim LX. Torque News will drive this offering in early 2017. The engine and transmission technology presented through 2017 Honda CR-V Touring is nothing less than an auto engineering wonder. I’ll expand on the technology in a future article. From a driver’s view, gone is the small truck-like drive dynamic of the CR-V’s of yesterday, this crossover is substantial, handles reasonably well on the 2-lane country sweeps, is a pleasure to drive on the highway at speed, and retains the ease of maneuverability in the city. 2017 CR-V takes the compact crossover segment to a new level of style and safety. As to driving, my favorite past time, Honda CR-V presents a very positive road to steering wheel feedback, with a much improved steering feel at high speeds, ease of maneuverability at low speeds, and a mere 2.3 turn lock to lock steering radius. I also experienced a true hydraulic-like brake feel, reduced drive maneuver side roll, acceleration torque-steer, and nose dive? None noted, Impressive! While we weren't afforded a foul weather driving experience while touring Monterey earlier in November, Honda engineering tells us that a much improved “real-time” all-wheel-drive system dedicates as much as 57% more torque to the rear wheels as required for all-weather traction and control. It’s all-time and seamless, I like that. I further noted a slight increase in ground clearance. All good! For 2017 Honda expands the availability of Honda SENSING™ active safety suite to all CR-V EX trims and above. Honda’s advanced safety directive is: “Evolve the driver assistive technologies to provide safety and security for all customers.” I’ve experienced Honda Sensing in Accord, Civic, Pilot, and Ridgeline, it works, and in my case has ‘abated’ an inevitable collision more than once. Read more about this technology here. What more can I tell you? 2017 Honda CR-V when compared to the domestic and import competition in the compact crossover segment is a hands down purchase and low cost ownership value. Is it perfect? I’ll leave that assessment up to you. Honda’s aiming for a late December dealership arrival for the reinvented CR-V. I look for the reinvented world-CR-V to be the best seller in the compact crossover segment out of the gate -- you may wish to reserve your test drive now. Parks, Please remember to tell your audience that not only is this new CRV built at East Liberty Ohio but also in Greensburg Indiana and also Alliston Ontario Canada. Not to worry I'm certain the level of quality is spot on no matter which plant it is built at. Thank you Mark. With expanded production the all new CR-V will reach more customers. Cheers! Trying to choose between 2017 crv,toyota rav or a subaru frester for my senora.I have a honda prelude and a subaru sti .note she currently drives a 1995 honda odyssey ex with just shy of 300,000 miles.